Superior wave upper surface with a high density foam insert, which offers greater cushioning to the coccyx. The vertex cushion provides coccyx protection at the base of the spine with an integral safeguard foam insert. Superior wave upper surface with a high density foam insert, which offers greater cushioning to the coccyx. 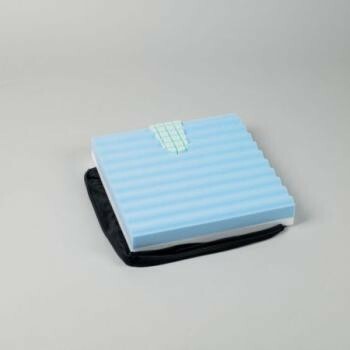 The vertex cushion provides coccyx protection at the base of the spine with an integral safeguard foam insert. Designed for use in a wheelchair and/or day care chairs, by patients in the low/medium risk category. Maximum User Weight: 111/2 Stone (75kg).